Is your skin in need of something more after cleansing? 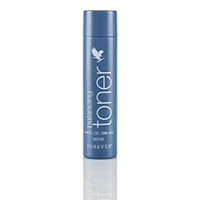 Balancing toner provides a unique blend of seaweed extract and sodium hyaluronate, which moisturizes and softens your skin. Plus, cucumber extract can help with your skin's texture and puffiness. Protect your skin against free radicals with white tea extract, a rich antioxidant, and a high concentration of Aloe to balance fluctuations of the skin. Combined, these ingredients provide a powerful blend that complements your daily routine. Give your skin more with balancing toner between your cleansing and moisturizing routine.